Everyone makes mistakes when visiting Disneyland, but the first timers are usually the worst offenders. 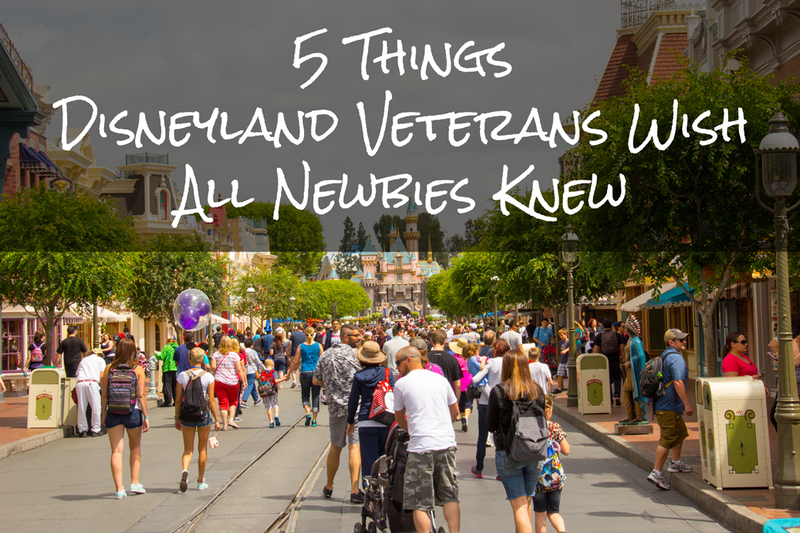 Here are the top 5 mistakes that all of us pro veterans wish that those newbies would stop making. It really is for their own good. We all have a first visit. However, sometimes the fresh meat is a little more obvious than other times. 4. Don’t stand in line for longer than an hour and a half! Did we miss something? Share your tips & tricks below and on our Facebook page. Every day the masses line up outside park gates at the ticket booths to purchase their tickets. Every time we see them part if us wants to say “You know you can purchase your tickets right now on your smart phone, don’t you?” but then we realize that maybe they like standing in lines. Or they’re practicing for inside the park. Next time, though, know that you can purchase tickets through an official ticket broker online to save a good amount of money on your tickets simply by ordering a day or two in advance. 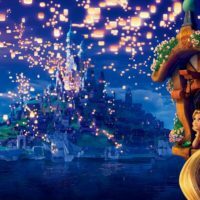 We highly recommend Get Away Today as the best Disneyland ticket broker, because they are an authorized agency and provide a discount on all tickets that you purchase. Check out all of their ticket discounts here. Also, if you are a Disneyland hotel guest, you can pick up your tickets at the concierge desk instead of waiting at the main gate ticket booths. At the beginning of EVERY line is an approximate wait time. Sometimes it says 5 minutes, sometimes it says 30 minutes, and sometimes it says 90 minutes or more! Why would you waste more than an hour and a half of your time to stand in a line for a 5 minute attraction? There are two ways to avoid this mistake. 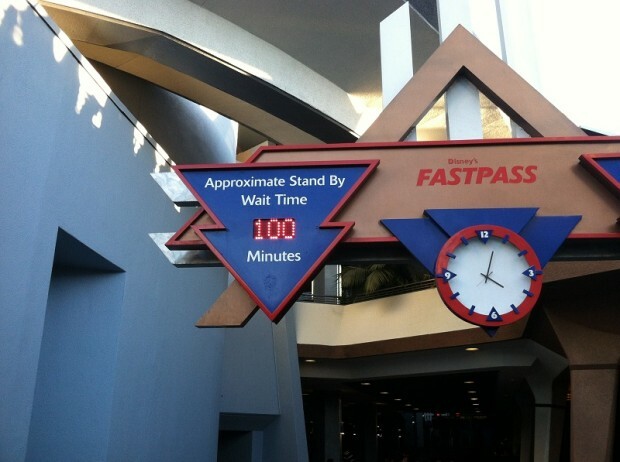 First, Fastpasses. They are free and very easy to obtain. Second, come back later or get to the park early. 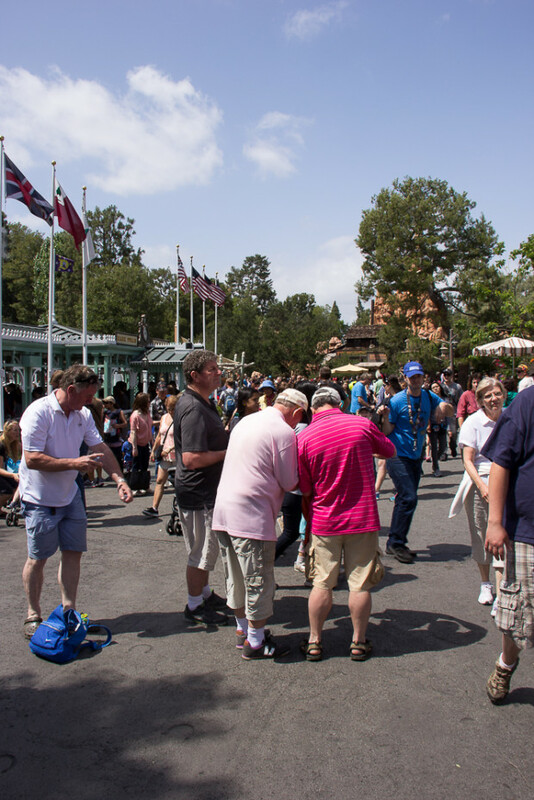 Third, see all of the methods that can help you improve your time in the parks. … Seriously? These are multi-million dollar masterpieces with massive cult followings about all the details. Not to forget: they are VERY BIG! 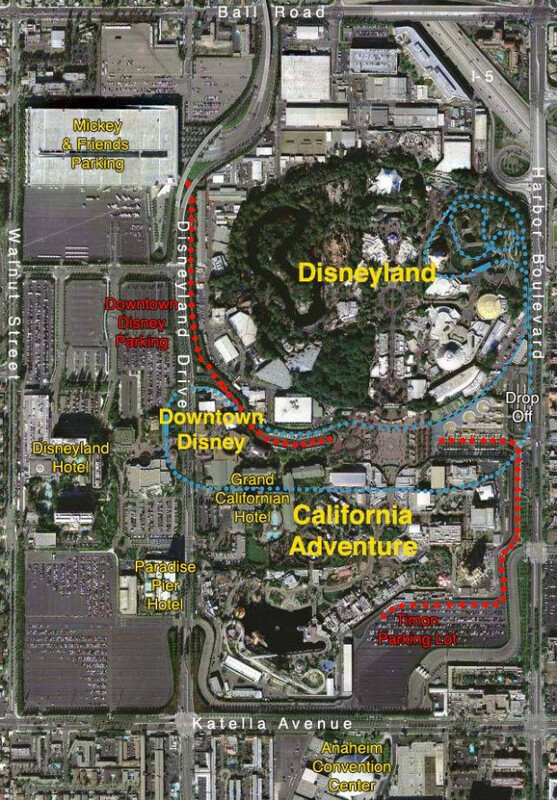 You’re going to try and do all 50+ attractions in Disneyland AND 30+ attractions in California Adventure? That is mathematically impossible. Do yourself a favor and SLOW DOWN! Enjoy a single park instead of trying to take in two. Revel in all the little details and Hidden Mickeys. Browse the shops and take a million pictures. Take in the next park on your next visit – it’s a reason to come back! The only person that I ever hear about doing this is the one day Disneyland warrior. 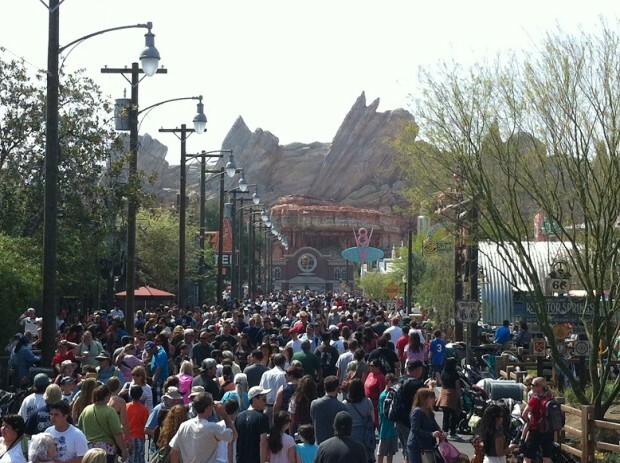 Disneyland is busy all the time. Period. There are less busy times but even then, it’s busy. The only time the park won’t be “busy” is at opening on a non-magic morning day (you can check the schedule), or closing time on a day when the parks close late (like midnight.) But, there are times of the year that are better to visit than others. See our calendar of the best months to visit Disneyland. Nothing says “newbie” like standing in the middle of the walkway with your map open and group huddled around it trying to decide what you’re going to do next. Your best plan of action is to make a list with your group before arriving at the park as to what everyone wants to do. If you need to add to your game plan, either decide over lunch/dinner/snack at a table or step off to the side. Also, as any good hiker will tell you, always stop in the shade so that you can save yourself from the terrible heat. This completely holds true in Disneyland as well. The temperature can get up into the 90s during the summer. That temperature only seems hotter when you are stopped in the middle of the path on hot cement in the sun. For more tips, photos, and Disneyland secrets, sign up for our Disney weekly newsletter. Sign up here. Dining… Eating food seems to take up a lot of time, especially in the parks. There are plenty of ways to minimize the amount of time spent stuffing your face with corn dogs, turkey legs and all you can eat BBQ. First, plan your meals! Know what you want to eat and where to find it. Second, if you’re planning on eating at ANY table service restaurant, make reservations in advance! It REALLY does save you a lot of time. Who has time to wait 45 minutes for a table when your time in the park already seems to zoom by in the blink of an eye?!?! Last, something that others suggest (but I, myself, don’t follow) is to bring your own food (snacks, drinks, goodies…) I choose not to follow the last one, because I like everything in the park to be ALL Disney. I don’t want fruits snack and granola bars… I want Matterhorn Macaroons and Tigger Tails! 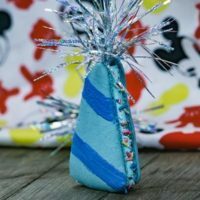 I guess bringing in certain snacks to help keep the little ones happy in between meals isn’t all that bad of an idea… But there’s no way I’m choosing the same thing I have at home in my pantry over anything made available only in the parks! As anyone who has listened to our Disneyland food podcast episode knows, I am absolutely infatuated with Disneyland dining. My only advice is to find a new granola bar or dried fruit that you have never eaten before to bring with you on the trip. Then, when you eat the bar after your trip, you will associate it with you great trip to Disneyland. Ha! Not a bad bit of advice. Thanks! You are welcome! That way you aren’t eating your regular old food. But, you also aren’t breaking the bank with Disneyland food. Shopping, Rent a locker. That way you can shop to you to your hearts content all through the day. Believe it is well worth the cost knowing you do not have to file in the shops at the end of your day with the masses doing the same thing. Your hot, Your tired, the kids are cranky and all you wanted do is go home a go to bed. But you need that souvenir to take home or the kids will cry all the way home and Uncle George will be upset you did not bring him something since he watched the dog all day. Trust me, the line In the Locker area is a 100xs shorter then that line in the Emporium and you will be on your way to your bed before most of those other people have made it to the cash register. Rent a Locker and save your sanity.. The best solution is actually Package Express in my opinion. Drop off your souvenir purchases at Frontier Mercantile, Store Comand, or the Main Street News Stand and they will hold them for you until you leave the parks that day. If you choose the News Stand, be aware that there are long lines to pick up packages at the end of the night. So I am a Virgo and I do everything in orer. Tiki, Jungle and Indiana Jones. Pirates Haunted and Splash, Then thunder mountain, tomorrow land and fantasy land. We takes the train in beteen. My advice is to walk, not run to your next attraction.. most don’t realize that guests in wheelchairs have to enter most rides in Disneyland through the exit.. I’m in the park several times a month, and always end up with someone falling onto my lap, or tripping over my legs/feet… better to take your time then to injure yourself or someone else. I especially love the “have a plan” part. Some tend to think it takes the fun and spontaneity out of it, but it only makes it easier to have more fun. Plus, when you know what you want to accomplish, you have room for the spontaneity! Definitely eat outside the park if you’re trying to save on money, McDonald’s across the street is never really packed and it’s really not too far of a walk! Also, screaming obnoxiously on a ride that is not scary just to do so…. is not okay and ruins other first timer, as well as a veterans, experience! There’s a flip side to #1, though…it’s folly for any newbie to try to plan ahead *too* much. 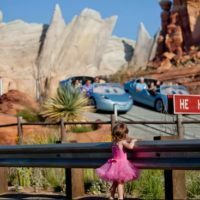 If you’ve never been to Disneyland before (or not for several years – the park changes), you probably don’t know it well enough to know what you’ll enjoy doing the most. Especially with kids – they get their hearts set on one thing, but then something else catches their eye and they change their minds in a flash. Be flexible, be spontaneous, be willing to improvise. 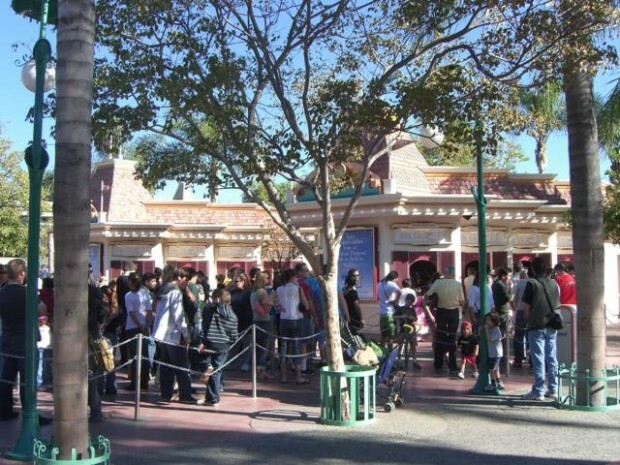 Ask Cast Members what an attraction are like before getting in line for it, or better yet, discuss the kinds of things you’d like to try as a family on your way to the park and then when you get there, ask Cast Members (at City Hall or the wait times board) what fits that bill. Let your kids choose some of the activities, but don’t let them run the whole show or they’ll get overwhelmed by choice and overstimulated. Another piece of advice I would offer, although obviously preferences vary, is not to get too bogged down trying to go on as many RIDES as possible. I’ve been part of groups, much less experienced than myself, who seemed to think that any minute spent not in a ride vehicle or in line for a ride was a minute wasted. They couldn’t be bothered to watch a show or sit down for a parade or slow down and enjoy the atmosphere. It was an exhausting way to experience Disneyland and ultimately left them dissatisfied because they effectively reduced it to the level of a cheap carnival that has nothing to offer *but* rides. little children get tired, so make time for them to take a nap. Get your hand stamped, go back to your hotel and let them rest. Everyone will be better off if you go back to the park rested. summer months means sunblock and hats. planning your tour of the Magic kingdom means the difference between a memorable one or nightmare. shop way before closing since so many people decide to souvenir shop at closing time. Rent a locker, a bit expensive now, but worth it. Why walk around with lots of purchases? Can’t take them on many of the rides. and , lastly, have a meeting spot in case your family decides to split up. Enjoy! Best days to go to the parks is when its raining, i worked at disneyworld orlando and thats when i would go all the time because people dont want to walk around and get wet. I totally agree. This is the best way to tour the parks.